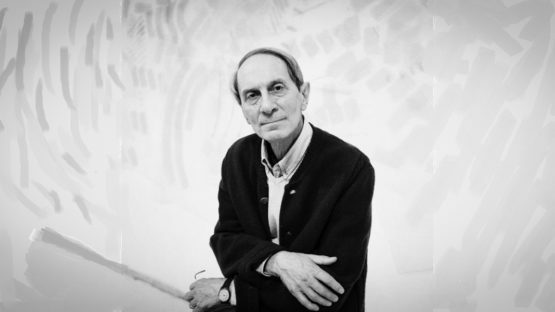 Giorgio Griffa is an Italian abstract painter, born in 1936 in Turin, Italy. He is best known for his images painted on raw, unstretched canvas, linen and burlap. Griffa showed artistic interest in his childhood, and began painting as a child, taking lessons from local painters at the Circolo degli Artisti in Turin, but he never received a formal art education. Giorgio became a practicing lawyer after completing a degree in law in 1958. In the sixties, Griffa began working as an assistant to the Italian painter Filippo Scroppo, a member of the MAC, Art Concreta movement and a teacher at the Albertina Academy in Turin. The format of his paintings that still characterizes his work to this day, his own personal style of abstract art was found in 1968, when he abandoned figurative painting. This is best described in a sentence ‘I don’t portray anything, I paint’, as Griffa himself stated. Painting with acrylic on raw materials, Griffa’s works are nailed directly to the wall along their top edge. The works are neatly folded and stacked into uniform sections when not exhibited, resulting creases that create an underlying grid for his compositions, which are active part of the painting as a color and lines itself. Griffa’s idea that ‘the painting is constant and never finished’, displays in his unique composition of each of his paintings. Always created from top left corner to right, his works display a deliberate end-point, maybe most precisely described as ‘stopping a thought midsentence’. Within the finite frame of his canvas, each artwork becomes a site of collaboration between painting and the painter as the hand works to reveal a constellation of signs and symbols. Griffa’s first solo exhibition was in New York in 1970, at Ileana Sonnabend’s gallery. Despite early associations with movements such as Arte Povera and Minimalism, Giorgio Griffa’s work was not exhibited in the United States for the next 40 years, until the exhibition named Fragments 1968-2012 at Casey Kaplan gallery in New York, which sums up four decades of Griffa’s career. This exhibition provides the viewer an ability to oversee the ways artist’s work and inspirations developed through the decades. The artworks from the late 1960s and 1970s display the use of simple and repetitive movement of the paintbrush, creating uniform task-like marks that serve to record the process of painting. These early, minimal compositions began with ordered horizontal and vertical lines that eventually gave way to the use of sponges and fingerprints. In the 1980s Griffa’s practice evolved to include expressive forms and brighter tones, coexisting with discordant arrangements of unfinished planes of color. Shift from ordered marks towards a broad range of gestures eventually led to the inclusion of numerical systems into his artworks in the 1990s, which are still characterizing his paintings today. This series display Griffa’s interest in mathematics and scientific structures that underlie our natural world. Infinite sequences, such as the Fibonacci series and the Golden Ratio, act as a parallel to Griffa’s practice, and additionally function as punctuations in the work’s vocabulary. Griffa lives and works in his hometown Turin, Italy.